The holiday season is a time for celebrations, family and lots of fun. Inevitably, it's also a time when stress levels rise and calendars are crammed. Finding just the right gift, dealing with the crowds, hosting (or visiting) extended family and travel headaches can all take their toll. When your social calendar is full, exercise is often one of the first things crossed off the list. You're not going to be in full gym mode all the time, and that's OK. Cut yourself some slack. However, making time for a sweat session is a great way to combat stress and to balance your mind (and body) during the rush of the season. Prioritizing your own health makes it easier for you to accomplish all the wonderful things you want to do for family and friends. Use these tips to help yourself stay on track this season. Get out the pen and paper and write down your to-dos in order of importance. Use this priority list to loosely schedule your time, and make sure to include time for exercise. If it's written down, you are more likely to get it done. Do you usually work out five or six times per week? Let yourself know it's OK to only have three workouts during the busier weeks. Is it ideal? No. But it will prevent you from mentally beating yourself up when your schedule gets crazy. If you get in more days, celebrate! You're overachieving rather than falling short. Running short on time? Short workouts are better than no workout at all. If you don't have the time for a full hour, cut your session down to 20 or 30 minutes. Something is always better than nothing. 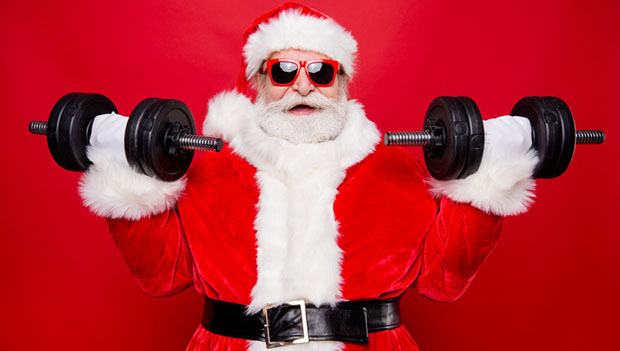 If parties are taking over your life and you can't make the time to get to the gym, try going for a walk, doing some squats between wrapping gifts, holding a plank while you wait for the kitchen timer to ding or, most importantly, taking five minutes to close your eyes and focus on your breathing. Motivation is almost always guaranteed when new workout gear hits the closet. While shopping for everyone else, don't forget to treat yourself too. Add some special items to your own list, so you'll be ready to hit the gym in the new year.